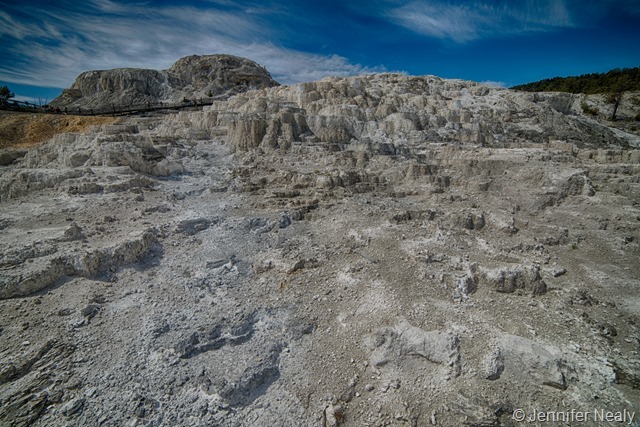 Our last stop in Yellowstone was Mammoth Hot Springs at the north end of the park. We stayed in this campground last year and liked it, and got an awesome site with a great view. 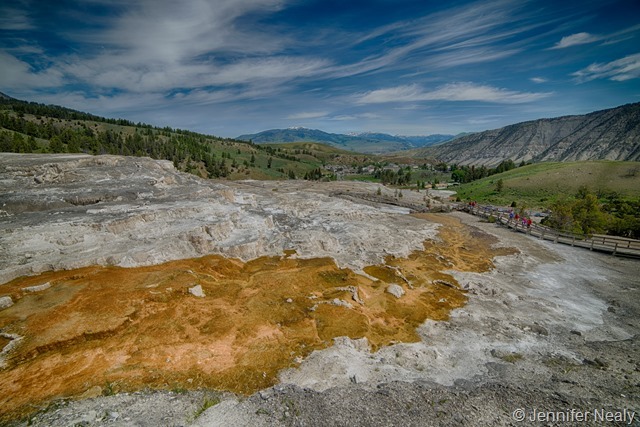 The Mammoth Hot Springs area is a group of hot springs on a hill of travertine. 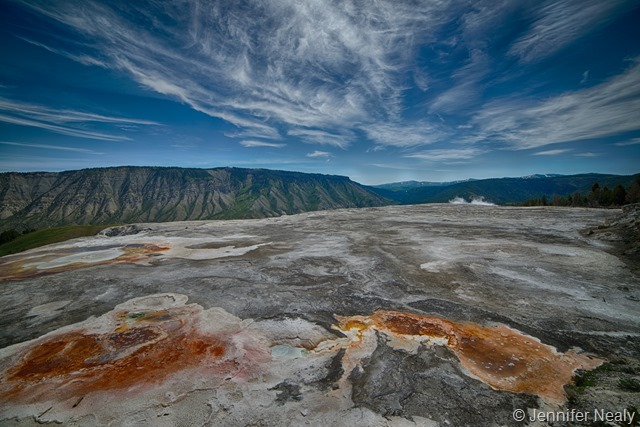 The features are referred to as “terraces”, and they look like large fountains. The area is huge – there’s a series of wooden walkways winding their way through the terraces ands springs, which you can just barely make out in a couple of the pictures. At the top of the terraces you get a great view back down towards the hotel and restaurant area. During our stay in Yellowstone, I read the book “Death in Yellowstone.” Deas thinks I’m crazy, but I like to research all the ways I might possibly die when we visit the national parks. It’s just good planning! I think this stemmed from last year when we were charged by an elk – I did a little internet research to find out how common elk attacks were, which led to all kinds of crazy stories. Which in turn led me to that book. 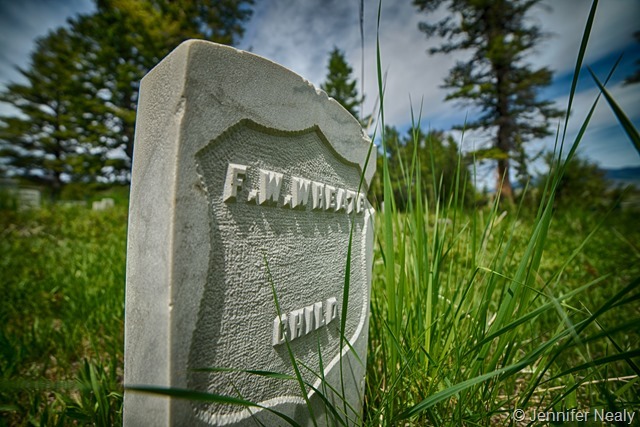 It’s actually a really interesting book, and in reading it I discovered that there is a cemetery inside Yellowstone. I grew up outside of New Orleans, where the graves are all above ground and therefore the cemeteries are fascinating and beautiful, so I’ve always been intrigued by cemeteries. 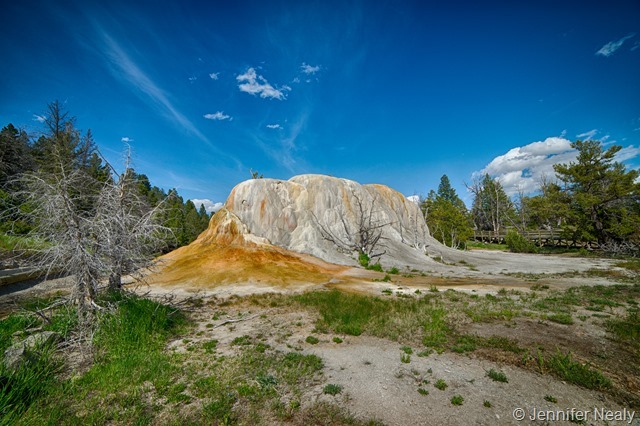 I knew I wanted to find the one in Yellowstone, which turned out to be located just south of Mammoth Hot Springs. There are a lot of children buried here, some of whose stories were told in the book. 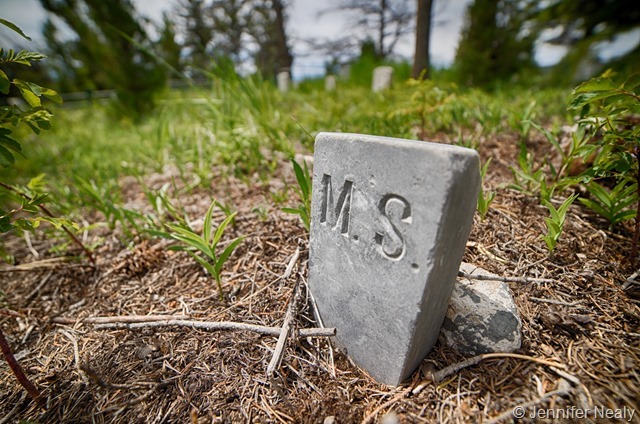 The headstones themselves seem to tell their own stories – some of them with the details engraved on them, sometimes just by their simplicity alone. It’s certainly not a typical Yellowstone attraction, but I thought it was beautiful. I spent over an hour there taking pictures. Hmm, that book does sound interesting. While in TX, I found myself wandering around a small town cemetery with numerous headstones from the civil war era, but nothing compares to the cemeteries in NOLA. I agree, the cemeteries in NOLA are pretty amazing. I so want to read that book. And how did you score such an awesome spot? If you have a Kindle I can lend you the book on Kindle. And that campground is first come, first served – all of the sites on our row had that same view. It’s a great campground! We read the Death in the Grand Canyon book after our first time there. It was really interesting, so I’m sure the one about Yellowstone would be too. Nice view from your site! I think there’s a book about death in Zion also. 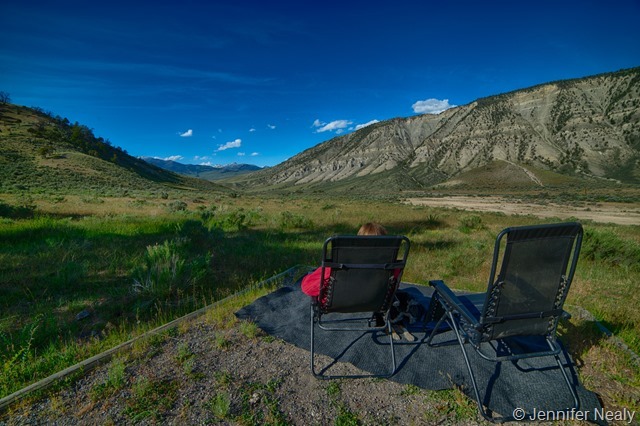 Lots of sites in Mammoth campground have the same view – it was pretty nice! What type of camera and lens do you use, such great pictures. Thank you! I have the Nikon D610. 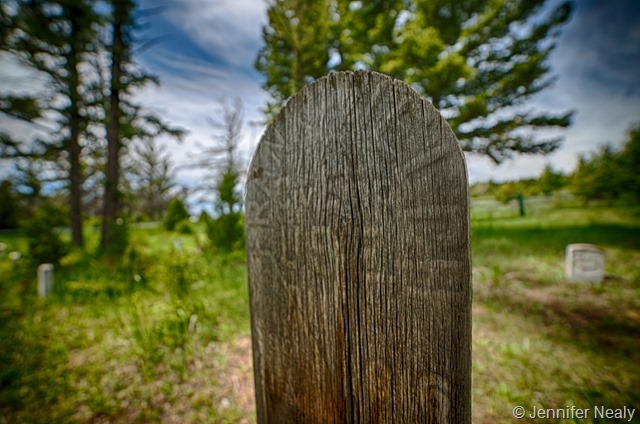 All of the photos in this post were taken with a 14mm f/2.8 lens, and I also have the 24-70 f/2.8. I love both of them. Enjoyed meeting both of you while at Mammoth. Absolutely stunning photos, Jen! I found that cemetery about a month ago when I was out there with my family. My brother in law just happened to mention that he’d seen a cemetery as we were driving by, and I made everyone take a time out while I walked back to that spot to take photos. (They are very kind.) For some reason, I’m fascinated by cemeteries. Thanks for bringing this one to light – your photos are so much better than the ones I took! I also am going to get the book now and read it. 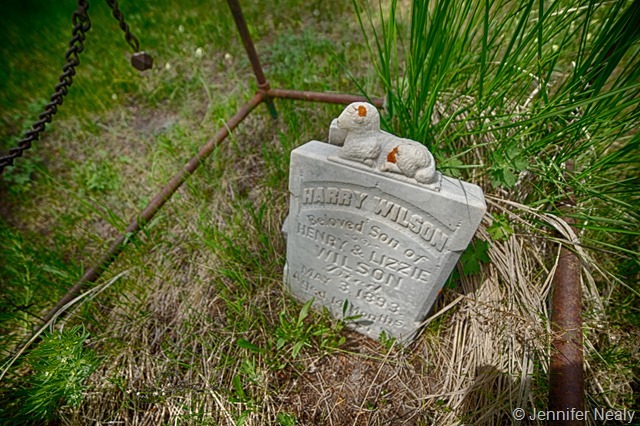 It’s a unusual place, this cemetery. The markings are sometimes very cryptic (no pun intended) and made me want to know so much more about the place. Jen – did you use a special filter? I just bought a Nikon before we went on the trip, and I need to know what little gizzies to ask for at Christmas this year! Hi Cindy! Thanks for your note. 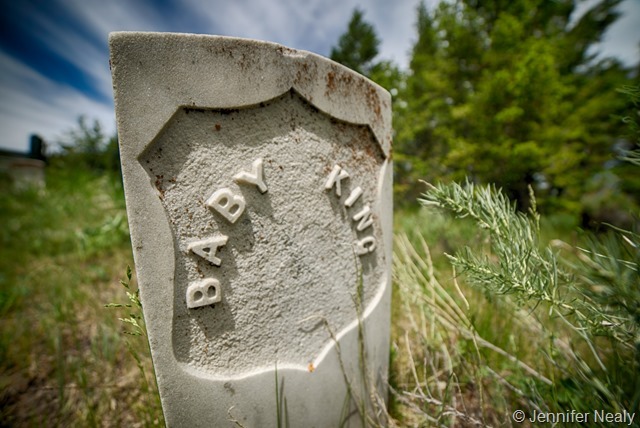 I love cemeteries too – so much interesting history. 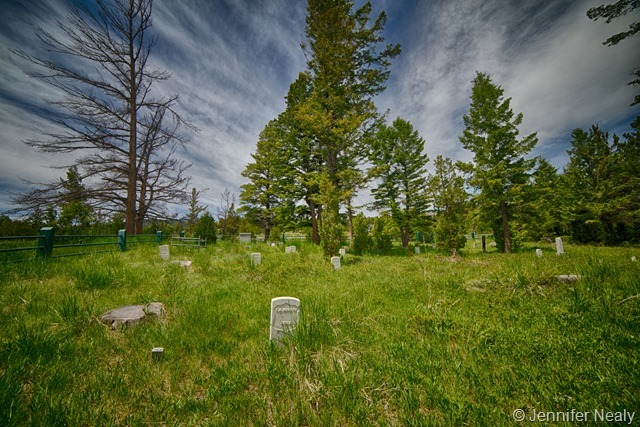 I did not use any filter on these photos – they were taken with my Nikon D610 and a 14mm lens. I do have two filters – a Neutral Density one for long exposures, and a circular polarizer which I sometimes use when taking pictures of water. But I did not use either of them on these shots.